These are a few of the ornaments we elves have been working on here at Acorn Cottage.The angel is a clothes pin design that my Mom did years ago, and I decided it would be nice to make some to hand down to family. Thanksgiving is a wonderful time of year to take time to reflect about all the things we have in our lives to be thankful for....so very many blessings. During the anticipation of the holidays I always like to have some quiet time to reflect about how fortunate I am! I make it a point to have Thanksgiving in my heart every night as I say my prayers and thank the Lord for all that I have. My family~My life revolves around them, and my happiness is seeing their happiness. They bring me so much joy, delight, and laughter and there is no place I'd rather be then spending time with them! My friends~Each and everyone of them, unique in their personalities, bring a richness to my life. To be able to talk, share dreams, hopes and wishes. We are there for each other through all the ups and downs of life, a constant support to each other. Some friends are seen frequently, others not a frequently as we would like, but always in our heart and minds. My home Acorn Cottage~As they say in Danish it's very "hygge". In one of my cookbooks Danish Food and Cooking...they say there is no literal translation for hygge in the English language. It's best described as mental and physical contentment, the security and warmth connected with good feelings about home and family. Hygge includes eating and drinking with family and friends in a convivial atmosphere of generous hospitality and comfort. That it was my home brings me, a sense of coziness and contentment, like no other place on earth. 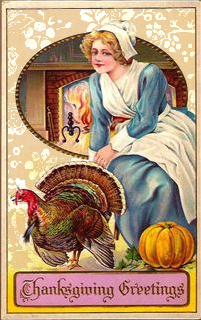 I wish for all of you, each and everyone one of you both near and far a wonderful Thanksgiving. My favorite Thanksgiving was one that for our pray we stood around the table, holding hands, and one by one gave our thanks aloud for all to hear. Count your blessings, for you will find there are many. You are each loved, more than you know! Went for a country drive up to a little town north of Kansas City and discovered these beauties! I love the old stone work and wrought iron fences! Can't you just imagine sitting on the porch sipping a glass of lemonade during the summer time? Such beautiful detail...can't even imagine painting all the nooks and crannies! Why can't homes still be built like this today? This little cutie is FOR SALE....trouble!!!! Can you imagine how beautiful it is going to look at Christmas time with twinkle light strung all over? Details like no other! Simple amazing. Never know what you are going to find on those random country drives! When Dan the Man and I were in Abeline, Kansas we went to the Dwight D. Eisenhower Museum which was pretty spectacular. Dan loves history, and I loved looking at the gifts received during President Eisenhower's term. You HAVE TO click on these pictures and enlarge them to fully appreciate the detail in the craftsmanship. Extraordinary!!!!! No flash camera's were allowed, so I lightened things up on my computer. You have no idea how intricate the detail on this tea set it, hours, days...weeks...months it must have taken to make! This desk is mosaic work like you've never seen before. So small, so detailed, I was just in awe! Of course this is just a small fraction of the gifts that are on display at the museum. Beautiful medals and ribbons that were given as gifts. An interesting fact is that he was the last President that was able to keep the gifts that were given to him. Now the government declares any gifts as it's own. I sure am glad these beautiful objects were on display for all to enjoy! Beautiful jeweled swords that were simply breathtaking! Abeline is a small town about 2 1/2 hours west of Kansas City. We really enjoyed our day visiting the LeBold Mansion (see previous post) and the Dwight D. Eisenhower Museum. Just look at this beauty. Out in the middle of Kansas in a small town named Abeline we stumbled upon the LeBold Mansion. Abeline is the home of President Dwight Eisenhower and is everything you could hope a small Midwest town to be. These are the grand doors that enter into this amazing mansion. It was built in the 1800's and had a series of owners. It once was an orphanage and also housed young ladies who were training to become telephone operators. When we walked inside and I could think was HOLY SMOKES! So opulent of an entry...Rich colors, beautiful carved wood, and something to take in visually at every corner! library. Usually, the library was the smaller room in Victorian mansions, but Mr. LeBold wanted to make an impression upon his guest and had a large room to receive businessmen. The antiques were just beautiful. I don't know why things like this aren't made anymore...or maybe they are and I'm just out of the loop! The current owners are partners who travel the USA finding homes to restore and then move on for another conquest. One of their "specialties" is doing a jigsaw of wallpaper on the ceilings. You can get a glimpse in this photo. Here is another ceiling shot...just amazing. The time and effort and measuring....unbelievable! The window treatments were a site to behold. Each room was paid careful attention to detail. I asked about the ceiling medallion, and although not authentic to the home, there is an artisan they contracted to make this plaster medallion from an antique version. Our guide was extremely knowledgeable about the time period and explained that back in the Victorian era, the home was were all the entertaining took place. There weren't movie theaters yet, so when people came to visit, there were special rooms in the house for different activities, and rooms that only the immediate family would use. This is the dining room...so spacious. Don't you feel like we live decorate very plainly after seeing these rooms? My goodness, everything was over the top. This was in Mrs. LeBolds private study. Can you imagine having a room all to yourself just to dress or have a friend over for tea? This bedroom was in a Asian theme...should have taken more pictures, but I was too busy standing with my mouth hanging open, listening to the stories about the house, saying "WOW" a thousand times over in my mind. This was the Moroccan room a family room of sorts. That is a tusk with the most intricate carving and I loved the puppets as I call them. This was the girls nursery. Sorry I didn't get a picture of the bed. It has a lovely patchwork quilt on it. Reminded me of the Shirley Temple movie The Little Princess. The home is up for sale for $899,000 and is currently in escrow. The new owners are planning on using it as a private residence, so I'm very happy I got to tippy toe inside before it will no longer be open to the public!